Drysdale sheep were developed in New Zealand by Dr Francis Dry of Massey University after he obtained a Romney ram that had a high percentage of hairy fibres in its fleece in 1931. There was little or no commercial interest in “hairy” fleeces at that time, but Dr Dry conducted research into this trait, and using a combination of Romney and Cheviot genetics produced a sheep with a coarse, long-staple fleece that had to be shorn twice a year. 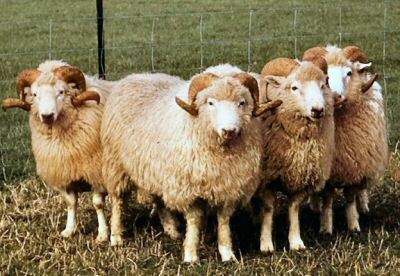 During the 1960s and 1970s there was a demand for fleeces of the type produced by this breed – named Drysdales after their founder – and they become relatively popular in New Zealand. The wool was used particularly in carpet manufacture and it had an advantage in computing environments where static electricity was a problem. At one stage there were estimated to be 600,000 Drysdales in the country. Some were exported to Australia and possibly also to the United Kingdom. The Drysdale is a medium to large sized sheep, of about 55 kilograms weight. The genetic makeup that produces the coarse fleece also causes both males and females to be horned – the rams’ horns resembling those of the classic Wiltshire Horns and those of the ewes usually being eight to nine centimetres long. In recent years the number of Drysdales being farmed in New Zealand has dropped dramatically through lack of demand for their fleece. In 2006 there were only two breeders registered with the New Zealand Sheepbreeders’ Association, and by 2010 the breed was no longer included in the flock book – any remaining breeders were switching to more commercially viable breeds. In Australia, too, the number dropped to 38 recorded breeding ewes by 2013.